A root canal treatment is a dental procedure intended to treat a dead or dying tooth and prevent or remove an infection. The infection is often caused by bacteria that live in the mouth and invade the tooth when either tooth decay occurs, your fillings leak or teeth have been damaged by trauma. Most patients respond well to their root canal treatment and can expect a healthy, functional tooth after their appointment at ToothKind in Brisbane. Endodontics is the treatment of the ‘dental pulp’—the soft tissue within your tooth, containing nerves and blood vessels. It is a significant part of the healthy development of teeth. However, it is possible for this dental pulp to become inflamed or infected. If it is infected badly enough, then endodontic treatment (commonly known as root canal therapy) may be necessary. Inflammation or infection of the dental pulp is caused when the nerve is irritated by chemical, thermal or mechanical stimuli. When a filling is very close to the nerve tissue or the tooth is fractured, directly exposing the nerve. Infection of the pulp is caused when bacteria begins to grow in the dental pulp. This can happen as a consequence of untreated gum disease or a deep cavity, where bacteria have destroyed most of the tooth structure. Symptoms and signs of a pulp infection or inflammation can include a dull or throbbing toothache, sensitivity to hot and cold, tenderness on biting or when touched, discolouration, even bad taste or unpleasant smell in your mouth. If a dental pulp infection is left untreated, the toxins from the bacteria inside the tooth can destroy the bone around the tooth and cause a dental abscess. The tooth continues to be weakened by the bacteria and eventually may break down completely. In this case, the whole tooth has to be removed. Root canal therapy is a method of removing the dental pulp tissue inside the harder shell of tooth to save the tooth. The quicker the treatment occurs, the more likely the success of the root canal therapy, so early intervention is important. Root canal treatment is a micro-surgery on your tooth and it carries several risks. Your dentist will explain this to you before the treatment start, but you need to be aware that a Specialist Endodontist may be called upon to complete any root canal treatment if it proves complex. Regular reviews of the tooth and x-ray images at regular intervals will be necessary after completion of the treatment, to ensure there is no sign of ongoing infection in or around the tooth. The bacteria must be removed to treat the infection in the root canal. This can be achieved by either extracting the tooth or attempting to save the tooth by removing the bacteria and sterilising the root canal system. 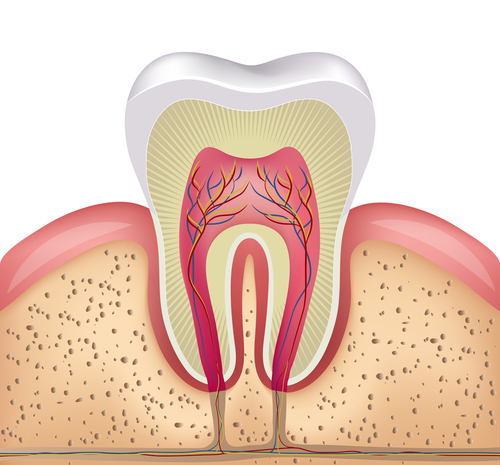 Once the bacteria have been removed the root canal is then filled, and the tooth is sealed with a filling or crown. If, after your Dentist has examined your tooth, taken an x-ray and decide that root canal therapy is your preferred treatment option, you may need to make several appointments to have this treatment completed. Usually, root canal therapy takes two visits. In the first visit, the diseased tooth and pulp debris is cleaned thoroughly from the middle of the tooth and its roots. This is done with the help of x-ray images, which help the dentist assess the length of each of the roots during treatment. The procedure uses very fine instruments called Endodontic files, which are like wire bottle brushes. They clean the roots of the tooth from the inside. The roots are also washed with antibacterial solutions to remove any floating debris and bacteria. Once the dentist is satisfied that the roots are clean from debris, they dress the roots with an antibacterial dressing and place a temporary filling over the top. In the second visit, the tooth is re-opened and flushed with antibacterial solutions. The roots are then filled with warm rubber points, bonded to the walls of the root canal with sealant. A restoration is then placed over the top of the tooth and in most cases, a crown is recommended shortly after root canal treatment, this protects the tooth from fractures which may allow bacteria to re-enter and re-infect the tooth.